Join the Defective by Design crew and celebrate International Day Against DRM (IDAD) this September 18th! Defective by Design (DbD) is a participatory and grassroots campaign run by the Free Software Foundation (FSF). DbD raises awareness about devices and media encumbered by Digital Restrictions Management (DRM), showing what they really are: Defective by Design. DRM is the practice of placing technological restrictions on digital media, and we're working together to eliminate it as a threat to freedom for computer users, as well as a threat to privacy for readers, viewers, and those making art, media, and more. DRM is an epidemic spreading across the Web, infiltrating our homes, classrooms, workplaces, and just about everywhere else we go. Tools, technologies, books, games, movies, and music are coming to us locked down with DRM -- whether they are streaming or claim to be locally hosted. For 12 years, we've celebrated IDAD -- making, organizing, protesting, and taking action to support the demolition of DRM -- and 2018 is no different! This year we will continue the fight against DRM and celebrate the work of activists, artists, and technologists who create DRM-free media and technology. You can read more about past IDADs online. For IDAD 2018, we want to demonstrate how great life without DRM can be -- and how pervasive DRM is. 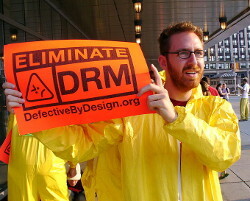 Join the Defective by Design coalition this Tuesday, September 18th as we go a day without using DRM. Join us and challenge yourself and those around you to a Day Without DRM. IDAD 2018 is your opportunity to tell others why you resist DRM, and convince them to join you. Whether you're an expert at being DRM-free or you've never considered what a day without DRM could look like, we want you to participate this IDAD. By joining with others on the same day, we send a powerful message: DRM's days are numbered. Before September 18th, we'll be publishing a guide to help you plan your Day Without DRM. It will help you identify some less (and more) well-known places you may encounter DRM, better choices you can make throughout the day, and options for games, music, and other media to enjoy. There are lots of other ways to participate -- as individuals or groups, online or in-person. Details, ideas, and information will be coming in the next few weeks. We'll be using the hashtag #IDAD. Keep up with IDAD! All future updates will go to our DRM Elimination Crew mailing list. Sign up for the mailing list on DefectiveByDesign.org to receive important IDAD news. Are you an organization or project interested in supporting IDAD? We're looking for vendors of DRM-free media, organizations that support the building of a DRM-free world, and those who believe in the mission of DbD to participate by offering sales, writing blog posts, organizing events, and sharing with your members about IDAD. Please contact us at info@defectivebydesign.org for more information. Together we can build a future without DRM. Want to support Defective by Design? You can make a donation or join the Free Software Foundation as an associate member.